Bali News: Canggu Intercontinental hotel has been built in Canggu Beach. This hotel development has raised the ire of local residents. Because the hotel building parapet who take public space in Canggu Beach. Development parapet conducted by Canggu Intercontinental hotel has violated the rules set by the Provincial Government of Bali. Menganggag trivial as the developer of the building's parapet. Though the walls have been completed seize public space. Causing public can not indulge freely around Canggu Beach. Canggu residents had complained the matter to the local government. The complaint has responded well by the government. Badung Government conferred the hotel building permits Municipal Police have been deployed to provide a warning to the developer. Parliament was also very angry with the construction of the separation barrier in Canggu Beach. 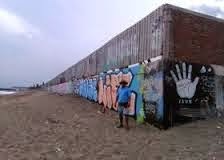 Because the wall was built in the sterile area, which in coastal areas should be accessible and be passed by anyone. In the local regulations governing the spatial, explained that any development in Bali, especially near the sea, all buildings must be at least 100 meters from the sea water at high tide. But the developer Canggu Intercontinental hotel has violated these regulations.